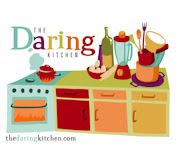 "The June Daring Bakers' challenge was hosted by Jasmine of Confessions of a Cardamom Addict and Annemarie of Ambrosia and Nectar. They chose a Traditional (UK) Bakewell Tart... er... pudding that was inspired by a rich baking history dating back to the 1800's in England." I have to say I was not a fan of this months challenge, too bad I have already missed my 2 for the year do to my relocation to Mexico and that all of my cooking stuff had to be left in Michigan. here is the recipe for BAKEWELL TART. curdle. In the words of Douglas Adams: Don’t panic. Really. It’ll be fine. After all three are in, pour in the almond extract and mix for about another 30 seconds and scrape down the sides again. With the beaters on, spoon in the ground nuts and the flour. Mix well. The mixture will be soft, keep its slightly curdled look (mostly from the almonds) and retain its pallid yellow colour. Last week I talked about my attempt to make a wonderful Peruvian seafood soup that we discovered at a restaurant near by called La Mar. While the soup that I attempted was delicious it was nothing like the parihuela that we at La Mar. The night of my post my husband and I returned to taste that soup again, I was determined to figure out how to make it. As before the soup was WONDERFUL, delivered to our table in a sizzling hot ceramic bowl, the broth bubbling and boiling right in front of us. That first taste, mmmmmmm flavorful and spicy...well that and I burned my mouth and had to grab a quick sip of beer. I ate that wonderful soup and was not any closer to knowing how to make it then I was before. Stumped and puzzled I ate my meal pondering the possible ingredients of the soup. To tell the truth the second trip to La Mar was a far better experience then the first, this time we knew what to order. We got the soup but we also got a Plancha, the marinara plancha to be precise. it is cooked on a hot cast iron pan with seafood and a garlic butter sauce, so great. The meal was heaven but I still had no idea how to make that soup so I asked and guess what neither do they. The restaurant makes a tomato based seafood broth and adds a chili sauce that they buy from Peru and I was informed that I would not find the Peruvian chili needed to make the soup. I think maybe next time go I will ask if I can buy the chili sauce they use. This is an old wheelbarrow out near the garden at an old family farm in Lake County Michigan. As always I am a day late and a dollar short. today is the second daring cook post date and I am whipping up pot stickers on posting day. I was worried that this was going to be a very involved long process to make pot stickers but they came together very fast and I had fun doing them with my 3 year old son. I made the dough and he kneaded while I put the filling together. then I kneaded the dough a little more for good measure. Once the dough sat for 15- 20 minutes I cut it into little 1 inch square pieces and Luka rolled them out while I filled them. Filling 3 year old rolled, not so round, pot sticker dough is a bit of a challenge. But towards the end he had is down, making perfect little round rounds to be filled. I chose to fry them as that is the usual method when I buy them from the store. And everyone enjoyed eating them. I would have gotten a cross section photo but Luka ate them so fast that I did not have a chance to get the camera out for that. I was not able to follow the exact recipe given in the challenge because here in Mexico City all ingredients are available some of the time they are never ready at a whim. Napa cabbage and shitake mushrooms were nowhere to be found so I left out the mushrooms and replaced the napa with regular green cabbage. I chopped the green onion (they were a little large) and the cabbage, sauteed them in a pan until they were soft. place in a bowl and added, chopped water chestnuts (bamboo shoots being another no find item) garlic, ginger, soy sauce, sesame oil, corn starch and once cool the ground pork. I will make these often not that I know how easy and delicious they are. For the first time since we moved to Mexico my husband and I were able to go out on a date. We hired a baby setter and simply went out for dinner but I was still the first time the two of us got to do something together in months, without the kids. We went to a Peruvian restaurant near where we live called La Mar that was highly recommended by some friends and the food was good (not great) and the staff were very helpful and even found and old menu in English for us and a staff member that spoke a little English. After pouring over the menu and asking for suggestions we ordered the clasico seviche and the Parmesan scallops for our starters. The seviche was ok, it was covered in cilantro and that was all I could really taste and being a person who apparently has the anti cilantro gene the whole dish tasted like soap to me. The scallops we cooked perfectly but the thick layer of cheese over them over powered the dish, I pulled the cheese off and very much enjoyed the scallop underneath. For our main courses I had the atun (tuna). This was a tuna steak grilled, placed over a bed of mashed potatoes with a sauce/gravy. As I ate the tuna the center was raw, not rare but raw, I could tell that the tuna was still frozen in the center when they put it on the grill. I think that if that spot in the center had not been frozen when they put the fish on the grill it would have been done perfectly with the right amount of seasoning, the mashed potatoes were nice but the sauce was a little overpowering for the dish. My husband got the parihuela which is a seafood soup with a tomato chili base and it was WONDERFUL the highlight of the evening. This soup was so good that I now have to figure out how to make it and this post is my first attempt at the soup and it was not even close; however, it was delicious. After doing a little Internet research on Peruvian cooking I learned that there are a few ingredients that are very common such as chillies, potatoes, onion and seafood. With that information I attempted the following. I made a fish stock with some great mackerel I found at the market along with some carrots onions and celery. In a large soup pot add fish stock, blended vegetable and potatoes. bring to a simmer and cook until potatoes are almost tender, about 8 minutes. Add in the fish and cook for about 3 minutes then add the shrimp, cilantro and salt and pepper to taste. Cook until shrimp is just done. Serve and top with a squeeze of lime and fresh green cilantro or parsley. While this soup was good it was nothing like the Peruvian soup at La Mar. The base was flat in comparison to the real thing and the chili used was not a good choice. This chili had a rich almost cocoa flavor to it and not the hot crisp chili that this dish needs. We are going back to La Mar tonight just for some more Peruvian Seafood soup. I am so excited to announce that I have been asked to be a guest blogger for the first time in my blogging career. Stop over at Rookie Cookie to see what I cooked up for her to serve for dinner. Thank you Whitney for giving me a place at your table. -A little something I saw on Design Sponge - Cottage cheese with strawberry rhubarb compote and reduced balsamic.